Each year we all spend loads of money on groceries but how often do you find yourself throwing food away because it’s gone off before you even have the chance to use it. The fantastic Compact Food Saver from Danoz Direct will save your food, and save you money. The Compact Food Saver will help preserve food without chemicals, without big machinery and without spending a fortune. It produces a professional quality vacuum. Once the air is removed, the bag is then sealed airtight, so now you can buy food in bulk, like meat for example. Divide it into freezer size portions then vacuum seal it. Fresh seafood will also last longer in the Food Saver Vacuum Bags. The heat seal strip completes the vacuum process and keeps your food airtight. You can even store a whole fresh fish then put it in the freezer and there will be no more throwing out mouldy cheese with the Food Saver. You can even save nuts and coffee from going stale. With the Compact Food Saver from Danoz Direct, it’s just so simple to extend the life of your food! 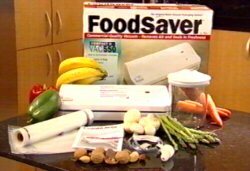 If you want to enjoy the savings the Food Saver can provide give Danoz Direct a call or get onto their website.